When? 10 a.m. to 1 p.m. 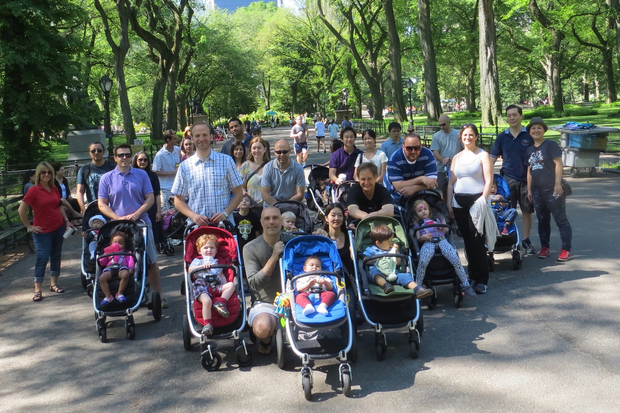 Presented by NYC Dads Group, New Boot Camp for Dads connects new dads and soon-to-be-dads to connect with veteran dads for a discussion of what it's like to become a father and what new dads need to know about swaddling, burping, changing and comforting an infant. How Much? $12 — Call BAM Ticket Services at 718-636-4100 to purchase tickets. Multilingual South African physical theater company Magnet Theatre perform inventive work using pictures, music, and movement to tell the story of a human relationship with a tree, and the changing of the seasons. When? 11 a.m. to 3 p.m. Celebrate the season with the Spring Fling Bash. Lots of free family and kids activities including family kickball, kite making, a rock climbing wall, tug-of-war and sack races. When? From 11 a.m. to 5 p.m.
New York on Location is a street fair celebrating film production in New York. Explore inside over 20 working movie trailers and trucks and speak with those behind-the-scenes movie professionals about what it's like to be on set. New York City's police officers and firefighters face off at Coney Island's MCU Park. Every ticket holder will also get discounts to Deno's Wonder Wheel Amusement Park, Luna Park and the New York Aquarium, in addition to a free box seat at a Brooklyn Cyclones game this season. When? 2p.m. to 4 p.m.
Brush the wool with carding paddles and learn how to spin yarn using a drop spindle. You can even make a felt ball to take home with you as you discover how wool was once used on a Flatbush farm.